With non-toxic plant-based powergreen technology. Cuts grease + grime. Certified cruelty free. 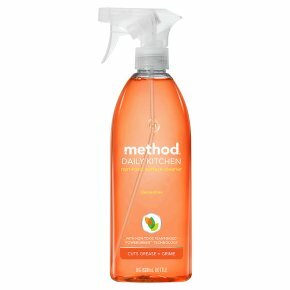 Hello, we're method. We are people against dirty®. In your hand, you hold the power to join us in the good fight. The fight to make our planet, and homes, a cleaner place. We are passionate believers in the Cradle to Cradle® design philosophy, meaning that each one of our products has a past and a future. That's why we make our bottles from old bottles and our non-toxic cleaners are biodegradable. It's also why every material we use is assessed by independent scientists for environmental quality + safety for people. Because we believe that cleaning products can put the hurt on dirt without doing harm to people, creatures or the planet. They can even smell like rainbows. It might sound like a tall order, but we're a small, passionate bunch with big ambitions. Powerful, non -toxic cleaning is not a myth. We're still working on the unicorns. You cook, we'll clean. When you're whipping up a tasty treat, you want your kitchen really clean. And that means free of chemicals, too. So we've developed a non-toxic kitchen cleaner with plant-based powergreen® technology. It packs a mighty cleaning punch to knock out grease and food spills, without leaving any residue behind - easy as pie. And nearly as satisfying. Easy to use: Spray on surface. Wipe immediately. Stand back and admire. For use on most. Sealed Surfaces. Worktops, tile, stone, wood, glass Psst: It's always a good idea to test in an inconspicuous place first.